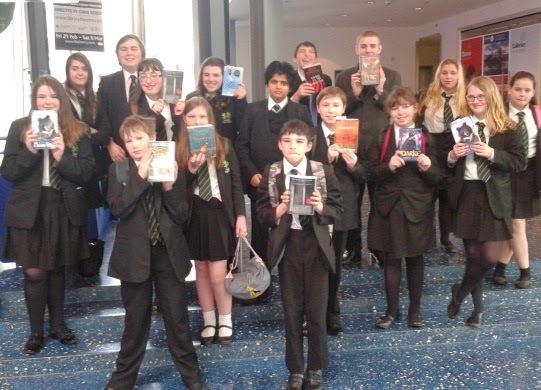 On Friday 21st March 17 pupils went on a trip to the Lowry Theatre to attend the Salford Children's Book Award: Winner of Winners ceremony. All of the pupils had taken part in either our WOW club or our ROFL club. We wanted to celebrate the dedication and talent these pupils have shown to reading and original writing. The shortlisted books had been chosen over the last 10 years as the winners of the SCBA, this year was the winner of winners! Pupils have been reading these during ROFL club on Wednesday evenings and using them as inspiration during WOW club. The ceremony started at 10am with Alan Gibbons as our regular compare. We listened to pupils from various schools who had prepared presentations about each of the nominated books. My personal favourite was the Molly Moon presentation as the pupils spent a great deal of time trying to hypnotise the audience into voting for their book choice. We then spent a further hour listening to the authors answer questions about how they became authors and what inspired their books. Finally, the winner was announced and it was no surprise that Michael Morpurgo picked up the WOW award. Michael Morpurgo decided it was a good thing to have prizes and said he was delighted with his accolade. He told the audience that Salford was a very special to him. He loved the area and had got to know the city well during the staging of War Horse at the Lowry. He also said that he hoped winning book Shadow might also make the transition to the film and stage following the path of War Horse and Private Peaceful. After the ceremony came to a close, the pupils were invited downstairs to meet the authors and get their newly purchased books signed. It was wonderful to see so many pupils from various schools feeling excited about meeting their favourite authors. I hope the day has inspired all to continue to read for pleasure and write their own books in the future. Miss Martyniuk & Miss Haydock.